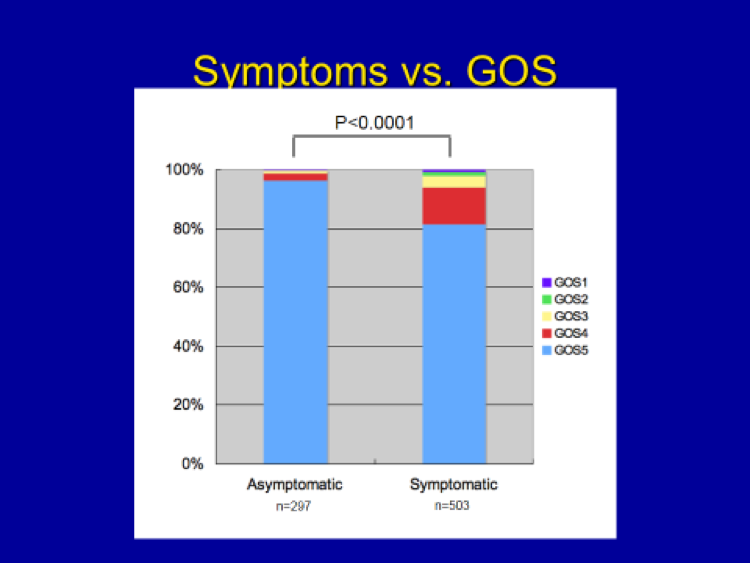 The incidence of “Good” outcome (GOS 4 & 5) patients goes down significantly from the “Asymptomatic” tumor group to the “Symptomatic” group. In particular, the incidence of “normal” outcome is about 98% in the “Asymptomatic” group as compared to 81% in the “Symptomatic” group. In short, whether or not the tumor is causing any preoperative symptoms does influence how well patients do following their surgery. This may have to do the the larger size and the presence of peritumoral edema (swelling) in the “Symptomatic” group of patients. In short, patients with “asymptomatic” meningiomas do extremely well following surgery.